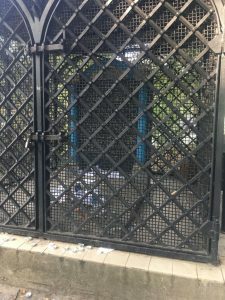 Thanks to the generous funding from the Naomi Foundation and the Levine Family, the Institute for Israel and Jewish Studies, together with the Department of Germanic Languages launched the Naomi Prawer Kadar Fellowship, offered to Columbia University Yiddish students in the summer of 2018. 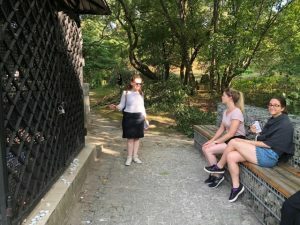 The five Naomi Fellows completed the first part of the program: the Naomi Prawer Kadar International Yiddish Summer Program at Tel Aviv University, and arrived in Poland for the second part of the program: a week-long study trip — “Exploring Yiddishland”— led by a Columbia faculty member. 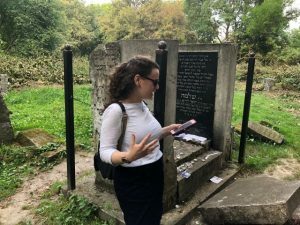 The “Exploring Yiddishland” study trip focused on some of the key sites of Yiddishland, the borderless space once centered in Poland, where Yiddish culture flourished for centuries: Krakow, Lublin, Zamosc, Chelm, and Warsaw. The experience involved learning about the Yiddish history of each place but also on connecting with the Yiddish present. We began with a Shabbat in Krakow, Kroke, once the world center of the Jewish scholarship and home to such prominent figures as Rabbi Moses Isserles, the Ramah, Natan Nata Shapiro, a.k.a Megale Amukot, and in more recent times, world-renowned Yiddish bard, Mordechai Gebirtig, author of many famous songs, Sara Shenirer, the founder of Beys Yakov Schools, and Natan Gross, filmmaker and film historian. We then continued to Lublin, stopping on the way in the shtetlekh of Tarnow, Zamosc, and the famed town of wisemen, Chelm. Lublin was an important Yiddish city, once home to the so-called Jewish parliament, The Council of Four Lands (Va’ad Arba Aratzot) and famous yeshivot. Throughout the trip, we retraced Isaac Bashevis Singer, the Nobel Prize winning Yiddish writer, who featured the Lublin region in his works. We then visited Warsaw, with its 350,000 Jews (30 percent of the city population), was the second largest Jewish city in the world (after New York) before the Second World War and the prewar literary and artistic Yiddish center of Poland. In addition to exploring the Yiddish history of Warsaw, we visited the award-winning POLIN Museum of the History of Polish Jews and learned about the Ringelblum Archives. In each of the cities, we connected with the contemporary Yiddish scene – we met with Polish Yiddishists and researchers who engage in Yiddish scholarship. This blog documents our journey – reflections and experiences acquired during the Naomi Prawer Kadar Fellowship. Driving away from the airport towards Tel Aviv University, the waves of heat rising from the expanse of creamy sand and stone punctuated by pink flowers reminded me of a Floridian summer. But any further nostalgia I might have felt gazing at the seemingly familiar landscape was broken by the impenetrable bursts of Hebrew coming from my cab driver’s GPS. This was the Holy Land—for so many a site of longing and desire, a point of departure and homecoming—and a place I could only say I knew Biblically because, ironically, I didn’t yet know it at all. Everything, like me, was quiet and sleepy. It was Shabbat, and the sun had many hours’ worth of travel left across the sky. As my cab driver wished me a nice stay in Israel, I pulled my suitcase along the cement, dripping in sweat, wondering how, only hours ago, I had been pulling my sweater more tightly around my shoulders against the damp chill of morning in Riga. I’d come to Israel to study Yiddish immediately following a program in the Baltic states on Russian émigré literature. Maybe it was the heat, maybe it was my continuing mental analysis of Samoylov’s poetry, but I felt odd, confused. The letters before me were familiar, but their arrangement was all wrong. And where were the vowels? From my early days learning Yiddish, Hebrew—so beautiful in its sound and appearance—had always been a bit of a tease, seemingly so near, yet in fact so very far from comprehensible. I tried to find my way to the dormitories primarily by my own intuition. There was no one around to confirm or contradict me. And I thought: what am I doing here? Save for two plaques in Vilnius, I’d barely looked at Yiddish over the past month and a half; how would I ever keep up in class, much less string together coherent sentences or compositions? And what was a Yiddish program doing in Tel Aviv anyway? Yiddish was born and bred far from this place, and upon its arrival in Israel it had been marginalized and even outlawed. I felt underprepared and alone. Was this walk to the dormitory a sign of things to come? Would the next month prove to be a clumsy, misinformed solo struggle? Early jet-lagged impressions are, thankfully, often wrong. And so was mine. The days and weeks to follow certainly presented challenges, but they were far from lonely or misinformed. Our lessons, lectures and immersion sessions were accessible and warm, and, consequently, very fruitful. My instructors and my peers were, on the whole, a mélange representative of Yiddish itself: many were Jewish and many were Israeli, but among us there were also Poles and Germans and Japanese in their mid-twenties. Many studied Yiddish for their graduate research, but they were also drawn to this language because, frankly, it’s cool. Perhaps it doesn’t seem so on the surface, but Yiddish is undeniably different. It’s rich, it’s persistent, and, in the case of its literary legacy, paradoxically avant-garde. And so I quickly came to realize that Tel Aviv was indeed a brilliant location for a Yiddish program. Israel is a center. Its centrality is most obvious in the geographical sense, of course, but Israel—and Tel Aviv in particular—is a place of new beginnings built upon cultural and linguistic intersection. Deeply religious and blatantly secular worlds share space within this city by the sea. Given its tumultuous track record, it only seemed fitting that, though initially suppressed, Yiddish had found a home here. After all, hadn’t it always been the language of a smaller community within a larger host country? Retired Israelis and American graduate students alike, that’s what we were: our own community. And Yiddish was the glue. Intellectually and emotionally, the Yiddish Summer Program was a wonderful period of growth. I made personal and scholarly connections not simply because of, but more importantly, in the language I was working to improve. The far-flung home addresses of my fellow students supports the fact that Yiddish is a language in diaspora, but the deep connection it fosters among its learners and speakers points to the continued existence, however unseen, of a kind of Yiddishland. 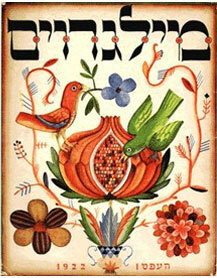 Yiddish studies are often perceived as a field centered on memory and restoration and preservation of a lost culture. It is certainly true that Yiddish is a language whose speakers were devastatingly reduced as a result of the Holocaust; those who survived were dispersed and displaced across territories and time. However, the Yiddish language and its cultural production are still very much alive; for proof one need look no further than recent Yiddish-language films like “Felix and Meira” or “Menashe,” or the highly popular (extended run!) of the Yiddish language production of Fiddler on the Roof at the National Yiddish Theater in New York’s Museum of Jewish Heritage. But films and plays nonetheless feel farther removed from real life—the fourth wall remains as division between the Yiddish speakers on display and those seated, observing the action and therefore only passively engaging with the language. The Naomi Prawar Kadar Fellowship was instrumental in demonstrating how and where Yiddish continues to thrive “on the ground,” so to speak, in less carefully curated contexts. In the classroom at Tel Aviv University, I interacted with Yiddish speakers of all ages and motivations: some sought to enhance their knowledge of Yiddish and reclaim the language of their parents, others—hailing from backgrounds as distant and removed as China–sought to learn from the ground up because they had fallen in love with works of classic Yiddish literature. Those moments which had the greatest resonance with me shared a common element: song. Like film and theater, concerts are often on stage, but the dynamic between performer and audience, and the way in which music responds to the moment—whether as a reaction to social reality during its composition or reacting to the energy of the audience during its performance—requires engagement of a much more dialogic nature. Musical performances in Yiddish from Esti Nissim, two young opera singers, a klezmer band and even one of the program’s own students (who had translated a famous Chinese pop song into Yiddish), served as vibrant examples of the breadth of today’s Yiddish culture, one in which the performers and audience were both active participants. These living Yiddish compositions were neither restricted to the confines of a text or the dinner table conversation of insular communities. As in the classroom, Yiddish served as the medium of personal expression for people from different backgrounds and different age groups. But something which was particularly remarkable to me was the breadth of the cultural spectrum populated by these musical performances. They were distinct in style and composition, ranging from the operatic “high” culture to the (crudely categorized) “low” culture of bar concerts to the modern global category of international popular culture, as reflected by the student’s translation of a contemporary Chinese song. The experiences of this summer engaging with Yiddish in a contemporary, popular context reinvigorated my interest and appreciation of this field of study. I am foremost a Slavic scholar whose focus lies in the Russian literary canon. But just as listening to Russian popular music or watching Russian films makes me feel like a participant in a larger cultural community, singing and dancing to klezmer music in the basement of a bar in Tel Aviv is likewise a reminder and a connection to the energy, the joy and the life contained in the words of Y.L. Peretz or Dovid Bergelson. As Sholem Aleichem’s trial of Shomer’s novels suggests, the “high” can’t really exist without the “low,”; the program’s formal instruction in grammar and literature grew richer and found reinforcement in jokes and folk sayings and our shmues with beer on the shore. Such real, modern experiences with living, breathing Yiddish helped bring me closer to Yiddish authors and their subjects. Poland has long existed in my mind as a site of oppression, both as recipient and perpetrator. My understanding of Poland—a skeleton of knowledge made up of historical facts—fleshed out and deepened as I physically experienced the country and interacted with its people. Simultaneously, these experiences broke down stereotypical representations I had constructed in my mind; Poland existed in my imagination alternatively as a grand kingdom connected to Lithuania, a piece of the Russian empire, a vibrant center of Jewish culture, and, finally, a site of pogroms, extermination camps and lasting anti-Semitism. It is nothing new to say that physically being within a foreign country facilitates a shift in perspective, as it brings the observer closer to the culture. But what was most interesting for me was viewing Poland alongside the other Naomi Fellows. I came to this place as a scholar, an American Catholic with a secular connection to Yiddish. The only non-Jew among my peers, I was acutely aware of my otherness and my distance from the sites we visited and the topics we discussed. The trauma of my peers was very personal, something that I could not access (for that I am grateful—I do not envy their sense of loss and pain), but their reflections allowed me in part to bear witness through their eyes. My sense of outrage and sadness as I took in the multitude of files within the Grodzka Gate archive in Lublin resonated with greater impact because, even if only in my mind, standing among my friends whose families might be recorded in those catalogs, there were fewer degrees of separation between myself and those who were lost. Conversely, my Catholic background opened up complicated feelings of personal resonance. My peers’ indignant anger and pain stemming from the violence and loss inflicted on their relatives was set against a backdrop of cathedral facades and crucifixes. Suddenly, things which had always existed for me as markers and symbols of love, self-sacrifice and peace transformed into markers of oppression and symbols of a population’s intolerance and pervasive hatred. I felt a kind of guilt and sadness that I have never known before, but these feelings were ultimately the impetus for very good, even healing conversation. In trying to share and explore the conflict I felt inside with my peers, they likewise shared some of their own pain with me. Speaking about our experiences, I think we were able to gain insight into our different perspectives, discuss the dangers and shortcomings of totalizing labels and narratives, and ultimately, even find a little solace. This summer was my second time in Poland as a Naomi fellow. Last year, my time in Warsaw inspired me to write about ancestral memory. My family came from Warsaw. These were my paternal ancestors, so they shared the Worenklein name. I had walked the streets of the city and although the city was restructured after the war, I knew that I was by no means the first Worenklein to walk through this city. With the help of our Yiddish professor, Agi Legutko, I had found records of my family in a Polish phone book and even got to see the place where my great-grandfather’s shop once stood. This August, when I returned to Warsaw I already knew the feeling of a connection to my past in triggered in me. Our second day here, I left the group for a few hours to go to the Jewish cemetery and see if I could find my family members there. According to the cemetery’s records there were at least 29 people with the surname Worenklein buried there. I knew that my great-grandfather had a lot of extended family in Warsaw when he lived here, I just didn’t know how big the Worenklein family was. 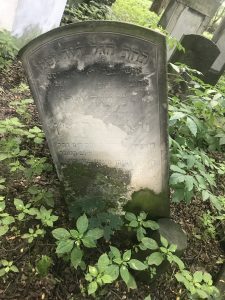 I don’t know how I am related to all of the people buried here, but I was able to find the grave of my great-great-grandmother, Simla Worenklein. Coming to this grave felt very similar to visiting the cemeteries in the greater New York area where I have family members buried. I came from this woman just as I came from my great-grandmother buried in Providence, Rhode Island. This was tangible evidence of my roots in this country – not just an idea, but something I could see for myself. I was able to read Simla’s tomb stone and learn a little about the life that she led. It was all there, her birthdate, the day she died, and a heartfelt message from her relatives. I did the math and learned that her 85th yartzheit, the anniversary of her death according to the Jewish calendar, is coming up soon on September 7. This is now a date that I can observe connected to an ancestor I now know more about. While Warsaw is a place of my family’s past, I also hope for it to one day be a place of my future. I want to spend at least a year living there, working with the Jewish community. I have been thinking about this for a long time but was always worried about being there alone. While I don’t have any family living there now and I only know a few people who live in the city, it’s a sort of comfort to know that I would be such a short walk from the grave site of so many of my family members. 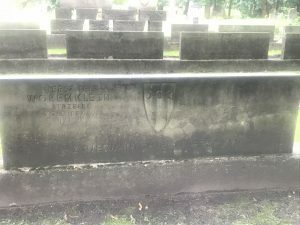 This summer I was able to visit two more graves of my extended family members, although I do not know how I am related to them. These experiences have encouraged me to do more research about my family’s history and if I spend time living in Warsaw I would be able to visit more of these family member’s graves and perhaps even visit my great-great-grandmother’s grave on her yartzheit. While I strongly believe that everyone’s future is one that they should pave for themselves, I also think that our past can often be an inspiration for us. I would love to learn more about where my family came from and learn more about the different Worenkleins who are buried in this cemetery. Most of the time when I tell someone I am going to Poland, they tell me to have a meaningful trip. They talk about how important the trip will be, never about how enjoyable. It seems to me that for these people, Poland is synonymous with “history” or “the Holocaust”, but Poland is still a growing country with its own happenings today. Even the Jewish community in Poland has been growing and changing in the past few years. Every time I go to Poland, I see these two sides of the country: one of its history and one of its present and future. And these two sides present conflicting views that always make me question my feelings about different aspects of this place. It’s no question that Poland was a country greatly affected by World War II. The Holocaust almost completely wiped out the Jewish communities there that were once so full and vibrant. However, there are many physical remains that remind of us this time. And with these remains comes the question of how we should be preserving them. How can we maintain a balance of moving forward while remembering the past in a country like Poland? When visiting the Galicia Museum in Krakow, we were asked a question similar to this one. What should we be doing with all of the old Jewish cemeteries? For me, the answer seemed clear. We should be preserving these places. But what if there was already something built on this ground? Should we tear down the new building and reinstate this place as a memorial to all the people that were buried here? Should we keep the new structure and build a monument for their memory? And this question only gets more complicated as you continue to think about it. So much of Poland can be considered a Holocaust site. From mass graves to deportation sites, this country is basically covered with these places. And sites like these deserve a tremendous amount of respect and recognition. Yet we also have to consider that Poland is a country with its own government and its own people. It wouldn’t be possible to keep all these sites untouched as memorials and still have a growing country. So what do we do? How do we find that balance where we can still remember and respect what happened but also continue to move forward? Is it possible to move forward and also never forget what happened here? I want to believe that it is but it certainly isn’t easy and it’s not always done right. When we were in Krakow, we saw an old synagogue that was turned into a bar. When we walked inside you could still see the original artwork from the synagogue preserved on the walls with verses from Jewish prayers. And pushed up against these walls were tables and stools where patrons would sit to get rowdy and drunk. Seeing this made me very uncomfortable. It didn’t seem appropriate to have such activities be done in a place like this. But would it have been better if the bar had painted over the walls, destroying the history that was once there? And when we went to Chelm we saw another synagogue that was turned into a saloon and event space with an American wild west theme. These walls were painted and redecorated but standing inside the event space it was clear to see where the ark that held the holy Torah scrolls and where the pulpit from which services would be led once stood. There wasn’t even any plaque commemorating what this space once was. Seeing this made me feel like so many years of Jewish history were not only being disrespected but were also being hidden, trying to be forgotten. Seeing things like this really upset me, but I also must acknowledge the need of this country to grow and create its own present and future in addition to the history it holds. It seems clear to me that this is not the way to do so, but then what is? This is still a question that I have no answers to and the more I think about it, the more unclear it becomes. 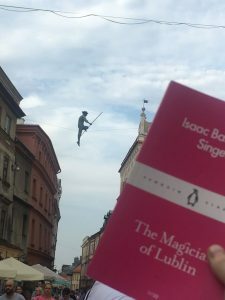 When our journey first began in Krakow, Agi bought a copy of Bashevis’ The Magician of Lublin in the Galicia Museum. Asking us who wants to read it first, I immediately responded, eager to finish as much as I could before our arrival in Lublin. Growing up, Bashevis was a household name, as he lived a few blocks from where my mother grew up, and my grandparents traveled with him to Sweden to accept the Nobel Prize in 1978. But while our bookshelves were stocked with his short stories and novels, the only story I could remember reading was Mayse Tishevits for a college course. And thus, I began to read Bashevis in Krakow. By the time we arrived in Lublin, I had only gotten through 30 pages, but was already hooked. Immersed in the world of nineteenth-century Poland, I could envision the interactions between Yasha Mazur, the tightrope-walking Jewish protagonist, and his Jewish and non-Jewish friends and lovers. For Yasha, each home provided a new opportunity for love, adventure and escape. While he was torn between his Jewish identity and the opportunities available if he abandoned his faith, Yasha’s tension arose because of the multicultural context in which he found himself. The Magician of Lublin paints a picture of a world that was, written after it was already destroyed. Even though the Jewish Lublin exists no longer, remnants of its Jewish past are being brought to life in innovative ways. 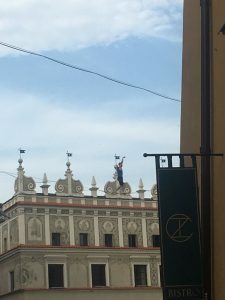 Walking into the town square, the first thing that caught my eye was a tightrope with a statue of a tightrope walker balancing over the buildings. But while that tribute to Yasha Mazur is ever-present, right next to the statue was a real tightrope walker! We had come just in time to catch the end of the Carnaval of Magicians in Lublin, an exciting time for the town. Overpopulated with visitors, each nook and cranny was filled with magicians, performers and spectators. After oohing and aahing at some of the performances, we met with Witek Dabrowski, director of the Retracing I.B. Singer Festival. Inspired by Bashevis’ stories that take place in 30 towns across Poland, Witek established the Festiwal Śladami Singera, as it’s known in Polish, to return some of the magic to the settings of those stories. The festival provides an opportunity for Poles to learn about the history of their towns, explore the world of pre-Holocaust Jewish Poland, and enjoy performances by world-class artists. Witek is not alone in his mission; he works for the Brama Grodzka (Grodzka Gate) Project, a cultural center in Lublin tasked with preserving the memory of the town’s 45,000 Jewish residents prior to World War II. Under the auspices of Tomasz Pietrasiewicz, the Project is located on the site of the historic gate that divided the Christian and Jewish quarters of the city, representing a multicultural meeting point. In addition to documenting the history of Jewish Lublin and its demise, the group, also known as the NN Theatre, puts on performances of Jewish stories in Polish. Entirely run by Poles, the Brama Grodzka represents the fact that there are no Jews left in Lublin to tell their own stories. Tomasz and Witek, inspired by Singer’s portrayal of a multicultural Poland, are doing wonders to restore, in whatever ways possible, the memory of a community in which Jews and Poles lived side-by-side. Bashevis, who was adamant about writing solely in Yiddish, and sharply focused on depicting Jewish Poland, could not have imagined the impact that his works would have on Poles who see his tales as part of their own national history. Now a symbol of the possibility of multicultural unity, Yasha Mazur and the worlds in which he lived provides an opening for Jews and Poles to connect with each other and rebuild with love a world that was destroyed through hate. As long as people like Tomasz and Witek continue working to interweave Jewish and Polish history and culture, I can hope for a brighter future. I had the privilege of studying under Eliezer Niborski and Yuri Vedenyapin during my month at the Naomi Prawar Kadar International Yiddish Summer Program at Tel Aviv University. While Eliezer taught us grammar, Yuri taught us literature, with many songs, films and comedy scenes thrown in. Yuri, who led song workshops in the afternoons, has a deep love for music, which became a central part of our class structure. Oftentimes, when going over new vocabulary, Yuri would sing a line from a Yiddish song to help us remember the newly-acquired words. One of his favorite songs was A Mol iz Geven a Mayse, which managed to make its way into almost every single one of his lectures. Although we did do quite a bit of singing, the focus of his class was literature, with poems, short stories, children’s tales and more. 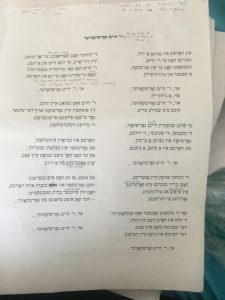 And in a fashion typical of Yiddish literature classes, we read excerpts from Bashevis’ writings, namely, R’ Khayim Gorshkover from the book Mayn Tatns Bes-din Shtub. The story is about a man named R’ Khayim, who comes from the town of Gorshkov but is currently living in Warsaw. He spends all his days yearning to return to Gorshkov, which in his mind is a Paradise in comparison to Warsaw, which he views as a Hell. At the end of the story, World War I breaks out, partitioning Poland once again. Warsaw was under German rule, while Gorshkov belonged to Austria. Unfortunately, poor R’ Khayim had no visa to cross the border into Austria, leaving him unable to fulfill his dream. To make matters worse, life in Warsaw become so unbearable as famine hits, and R’ Khayim finds himself lauding the good old days in Warsaw when food was in abundance. The story ends thusly: “…I would say to him, ‘Reb Chayim [sic], do you remember how you used to complain about Warsaw? You yearned only for Gorshkov.’ Reb Chayim raised his yellowish eyes. His moist glance said silently, ‘Who dares even think of Gorshkov now?’” (In My Father’s Court, p. 129.) Depressing as it may be, this tale was a literary highlight of our time on the Kadar program. At the end of the month, each class was expected to prepare a song or skit to perform in front of the entire program for the closing ceremony. Naturally, my class decided to compose a song about R’ Khayim Gorshkover to the tune of A Mol iz Geven a Mayse. It was the perfect way to capture our time together on this wonderful program and to document all that we had learned this summer. 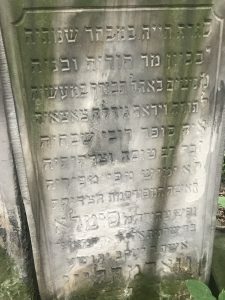 The Lublin Jewish cemetery, founded in the mid-16th century, is notable for two famous rabbis buried there: Rabbi Ya’akov Yitzchok Horowitz, the Chozeh of Lublin, and Rabbi Shlomo Yechiel Luria, the Maharshal. I had the privilege of discussing each of their lives at their final resting places. The Maharshal, rabbi during the golden age of Torah study in the 16th century, succeeded Rabbi Shalom Shachna as head of the Lublin Yeshiva, and eventually went on to begin his own yeshiva. The yeshiva he built was focused on a new way of Talmudic study, with an emphasis on returning to the sources of Jewish law, or halakhah, to chart a clear trajectory of how those legal conclusions were reached. 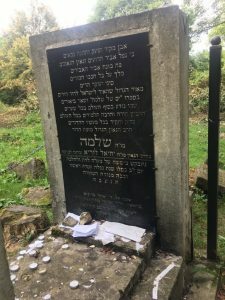 Because of his passionate emphasis on halakhah, his tombstone includes the line, “he is requested in the Heavenly Yeshiva for religion and halakhah.” A (likely apocryphal) story is told about him: A student of the Maharshal once asked him what to do about Jews who walk around without kippahs. He responded by saying that one must focus on their interior, as opposed to their exterior, just like his method of Torah study was focused on the interior core of Torah. The title of the Maharshal’s magnum opus, the Yam Shel Shlomo, or the Sea of Shlomo, was carefully chosen to be polemical in nature. Not long before the publication of his book, another rabbi, Rabbi Yosef Karo, published a code of law entitled the Shulḥan Arukh. Rabbi Karo’s book provided a uniform list of rules as a “Set Table” (as the title describes). The Maharshal, in opposition to this view, published his halakhic work using the imagery of a sea, implying that the law is a lively and vast enterprise, as opposed to Karo’s wish that it be a rigid code. The Chozeh of Lublin, born in the mid-18th century, was representative of a vastly different religious landscape. As a third generation Chassidic rabbi, he established the role of the tzadik, a spiritual mediator between the people and God. The creation of the tzadik meant that people were wholly dependent upon him. The Chozeh, or Seer/Prophet, was called as such because even was considered capable of seeing into people’s souls. Under his leadership, the Chassidic movement greatly flourished. As legend has it, there was another rabbi in the Lublin community who was resentful of the Chozeh’s popularity. People were leaving his congregation to flock to the Chassidic one, so he tells the Chozeh to instruct the people to not attend his sermons. The next day, the Chozeh makes an announcement that no one should attend his sermons because he’s not a Torah scholar. In response, the people were so impressed by his humility that even more townsfolk attended his lecture the next week. The rabbi then tells the Chozeh to make a second announcement that he is a big Torah scholar, so that the people will think he is egotistical and stop attending his lectures, to which the Chozeh responded that he cannot lie. As a Chassidic rabbi, he took on the burdens of all of people who came to him. The position took such a toll on him that by the end of his life he was living in partial isolation. When he died on the holiday of Simchas Torah, his opponents (the Misnagedim) claimed that he hurt himself, whereas the Chassidim reported that he died of heartbreak. The veracity of these tales notwithstanding, the extent to which legendary folklore has developed around these two figures highlights the immense positions they hold in the world of Jewish history and imagination. Spending time in Lublin helped provide a cultural, historic and geographic context for me to understand the worlds that these two Torah scholars occupied. I always have difficulty explaining why I am studying Yiddish to those outside of my family and Yiddish classes at Columbia. I have no academic motivation, or area of research, that pushes me to Yiddish. Nor do I have any living relatives that know more than phrases and words that I can speak with. I study Yiddish because it’s dear to my heart. It feels natural to me in a way that other languages I have studied do not. It is comforting to use words like shlep, kinder, and shul, that I have always known and mixed with English, in full sentences af Yiddish. I was very excited to study amongst others who felt the same way at the largest Yiddish program in the world. Unfortunately, this expectation set me up for disappointment. Many of the people involved in the program are not necessarily passionate about Yiddish itself, or are excited to spread the love of the language. I had a difficult time trying to figure out why using Yiddish for research, and not caring about speaking it or teaching it to children or friends, made me uncomfortable. A constant frustration in my class was students who stopped the conversation to ask what “moshe-rabenu”, “Sukkos,” and “Toyreh” meant. Having gone to a Jewish elementary school where we only spent a few weeks discussing the basics of Christianity, there have been many times in high school and college classes where I have missed a biblical reference or not known the meaning of a word. Never did I waste others’ time asking what it meant, and instead, made a mental note to google it later, or would try to figure out the situation from context. I understood that I was the minority and I did not need to draw attention to that by wasting the time of others. Therefore, students studying Yiddish, a language that to me is so ingrained in Ashkenazi Judaism and life, wasting everyone else’s time by asking an explanation of something so basic to the religion, was deeply insulting. Every other day felt like a flashback to being pestered with questions about my name, rules of kashrus, and holidays throughout high school. This was not the experience I was expecting. Still, I felt a sense of solidarity with the other Jews in the class who were studying the language for the sake of knowing the language. I felt a sense of comfort and camaraderie that I didn’t get the privilege of in high school. Though I still felt the disconnect of a member of a minority group, I was, in the whole of the program, a majority. I carried this disappointment and frustration around with me. Even in Israel, over 70% Jewish, I was often feeling uncomfortable. Many Israeli Jews who I told I was studying Yiddish were confused and laughed. I felt inadequate not having a research proposal to explain to any teacher who asked. As much as I loved my teachers and most of class time, there were times where I questioned why I was doing this program at all. I decided to visit Yung Yiddish, a quirky and strangely heymish book collection / Yiddish museum located in the central bus station. There was an enormous collection of Yiddish books, newspapers, sheet music, posters, and more. We looked around, found books we wanted to purchase, and decided we were ready to head back. We ended up sitting down with one of the volunteers and talked to him, af Yiddish and vegn Yiddish for about 40 minutes. It was exciting and rejuvenating to sit with a Jewish Israeli who loved Yiddish. He was not pursuing it as a money maker in any way – he grew up speaking it at home and wanted to continue being involved in supporting the language. Though revitalized by my experience at Yung Yiddish – and the passion for Yiddish shared by the other Naomi fellows, Poland is a difficult place to be Jewish without feeling isolated. Tours of the ghettos are advertised all over the Jewish quarter by Poles. We visited an old Jewish cemetery which, in some spots, was littered with popsicle wrappers and bottles. Synagogues and mikvehs have been converted into bars. It can be difficult to find comfort. We met with the head of the Jewish Studies department at a large university, who told us how large the department was. This was exciting. The majority of those studying were not Jewish – though this felt strange to me, as though the Jews in Poland were these ancient creatures to be studied and thought about, I decided to have a positive attitude about it. This is better than ignoring the history! Until she explained that the reason for this was the program that links them with startups in Israel – this was not about Judaism at all, it was about money. I grew frustrated and distrusting of the Poles leading tours and teaching about Judaism. Did they care? Or was it simply a good industry? Why did I care so much? These questions continued to plague me until we visited the Grodzka Gate NN Theatre in Lublin. The Theatre – which is more of a hybrid between a theatre and a museum, is dedicated to remembering the Jewish lives lost in Lublin. 45,000 folders, one for each Jewish person living in Lublin before the war, line the walls of every room. The entire space is beautiful, moving, and heartbreaking. Photographs of Jewish families and friends can be looked at. Our tour guide was not Jewish, but she was clearly passionate about this project and goal. She had love and excitement and sadness for those who were killed and dedicated her time to their mission. This moved me greatly. This woman had no connection to the Jewish people and yet, she was helping encourage their memory. She was not trying to make easy money, she was trying to save a legacy. I felt a similar satisfaction and comfort at the Warsaw JCC. We had a very long, fruitful, and moving conversation with the leader of the institution. She told us that a lot of their members have Jewish fathers, and non-Jewish mothers. However, the mothers are the ones who encourage the children to join the JCC and explore their Jewish identity – not the fathers. This sat with me for a long time. These, too, were non-Jews who were pushing and encouraging Jewish identity and love in Poland. I felt comforted by this for the rest of the trip. Though I faced a lot of frustrations, I finally felt hope. I don’t think I will ever feel entirely comfortable with others taking my history for their own benefit. But I can try to understand that it is not always with malintent. My feelings toward Poland and its people are unkind. I think it is this fact that’s hindered my reflection on our trip. I have a very difficult time expressing myself dishonestly, so the prospect of attempting to provide an overly positive or hopeful response to my time in Poland makes me profoundly uncomfortable. With that in mind, I can’t allow myself to avoid expressing the fact that I feel a deep distrust of Poland. This distrust weighted each step I took, each handshake I offered, each thought I shared. While I don’t expect to be fully able to view Poland in an objective, forgiving way, I must consistently remind myself of the many Polish people who have dedicated their lives to preserving the memories and histories of the millions of Jews killed in Poland in the Holocaust. I would like to focus on two such people: Witek Dabrowski and Tomasz Pietrasiewicz. We met Witek in Lublin, at Teatr NN, the experiential/artistic museum founded by Tomasz Pietrasiewicz. Witek, like many other Polish people, was exposed to the history and culture of Jews through Bashevis Singer. After the war and Communist rule, as we learned from various Polish people throughout our trip, looking toward the non-Polish past was not the norm. Jewish history was glossed over—a blip in the timeline of history that is best left with the grandparents. Singer’s literature offered a glimpse into the world that was once such an important aspect of the culture of Poland. One such work is The Magician of Lublin, which inspired Dabrowski’s Singer’s Footsteps festival. Together with a band of artists and performers, Dabrowski travels from town to town, increasing his tour by one locale every year. He and his team, which often includes Jewish performers, visit towns, awe the community, and offer what is, to me, the greatest gift of all; an awareness and consciousness of the past. Dabrowski organizes workshops with the local populations he meets along the festival’s route and offers them the opportunity to confront their shared past and the history of the Jewish people who once lived among them. I am so grateful for this project, as it seems that ignorance of the former Jewish communities of Poland seems rampant. The hope for a more tolerant, historically conscious Poland lies in the works of individuals like Dabrowski, who, identifying a systemic cultural lack, take it upon themselves to repair the damage left in the wake of the Holocaust and the Communist regime. Another individual whose work sustains hope and preserves the memories of the Jews of Poland is Tomasz Pietrasiewicz (who, incidentally, comes from the same town as my great-grandmother). Pietrasiewicz’s Grodska Gate museum is unlike any museum or Holocaust memorial I have ever been to. Formatted as an experiential art exhibition, the Grodzka Gate – NN Theater center, situated between what were once the Jewish and Christian quarters of the city, continues to function as a meeting place of disparate cultures and traditions. I never felt more hopeful or inspired in Poland than at this museum. My anxieties and distrust toward Poland and its people felt relieved; here was a center of people whose mission was to piece together the history and lives of the 43,000 Jews who lived in Lublin at the start of WWII; here people are trying to understand, to piece together a story that could have been lost to generations of Poles without the work of this organization. Pietrasiewicz and his organization work to uncover the mysteries of the Jews who once lived among them. He returns to the victims of the Holocaust in Lublin their identities and their personhoods that were taken from them in the Holocaust. No longer are they just a part of a daunting statistic, but they are shown to be vital members of the dynamic, storied, fascinating community of Jewish Lublin.